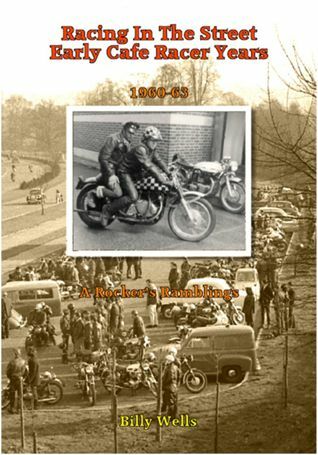 “Authentic tales of Early 60’s teenage, motorcycle, daring dynamism and all the surrounding capers and comedy. Vividly told with all the passion and humor of the day. A historic document on the epoch; chronicling the emergence of the Mods, the coining of the word ‘Rocker’, the rapidly evolving, post war, youth culture. This story of a young crowd, hanging out in a cafe in Morden, South London, on the edge of a vast Council Estate, is illustrated with many photographs of the bikes and the cafe, fun and games on seaside adventures, racing in the streets of London, scorching down the by-passes at 100 mph plus and general posing. It spans the years 1960-63 which was a time before there were too many rules. A kid could buy a 650cc motorcycle at 16, tie on some ‘L’ plates and blast off down the highway with fire in his belly and the breeze of glory in his hair.